Two Russian labels united to release a split CD between a Russian and a Serbian band (with strong ties to the Slavic traditions, at least thematically). It all fits together quite nicely, you must agree. Magnificent cover art was also done by Serbian designer Nemethor, to complete the Slavic union. The disc is opened by the Russians, Vedmak, almost two decades old horde, however with almost 10 years of discographic silence that was only broken two years ago with their second full length album. This time they are coming with 3 new songs, all written in Russian, with a bonus Satyricon cover. This quintet performs Death Metal with notable Thrash and (less notable) Black Metal touches. In essence, they seem to be followers of eastern Death Metal traditions, with considerable Vader influences. Their music is based on relatively simple and “catchy” riffing and many different rhythm patterns where even bass guitar gets a decent exposure. Everything is well-rounded by the very strong performance by the vocalist to bring a decent amount of energy and aggression needed for the full impact of this kind of sound. 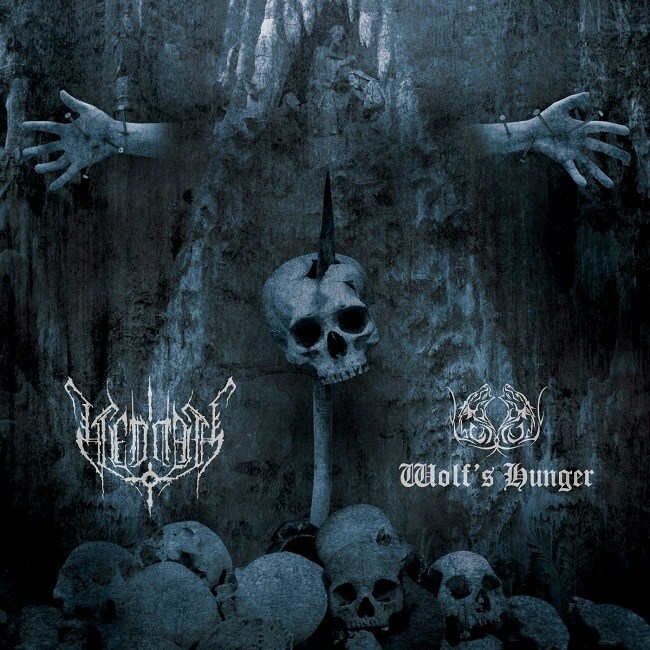 Wolf’s Hunger is a Serbian quartet that delivers Blackened Thrash Metal for more than 15 years now. While strongly inspired by Slavic paganism, Wolf’s Hunger never strayed into folklore music and still thread their path of pure, guitar driven Metal. They have always had a feel for the catchy riffing and memorable choruses which doesn’t leave them here either. Two new songs they have delivered here are well-developed although based on traditional riffing and rhythms. Finishing it all with a decent rendition of a Slayer classic, Serbians once again display the full extent of their creativity which needs to be recognized well beyond the native borders. This split release is definitely intended to Old School Metal maniacs. Everybody who grew up on the ‘80s and early ‘90s Metal will surely be satisfied with these 26 minutes of music. Those who need innovation and progressive tendencies can easily forget about this.